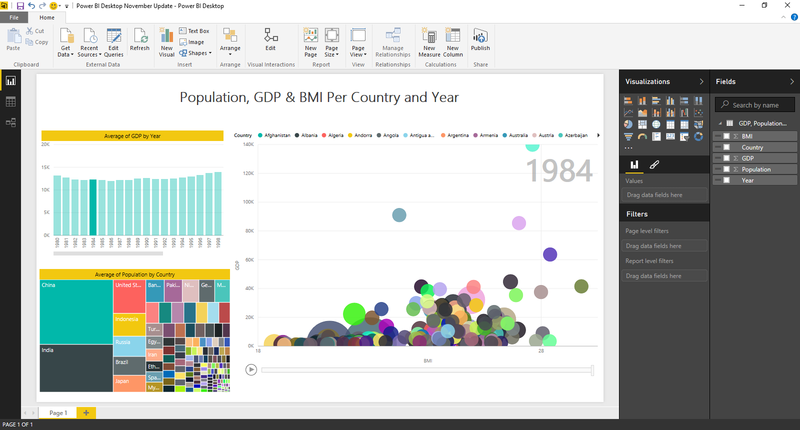 We’re releasing today a new Power BI Desktop update, which is loaded with tons of new features. Precisely, 26 new features have been added or improved in this release. Some of these features have been requested by many of you so we expect you will really enjoy this update. 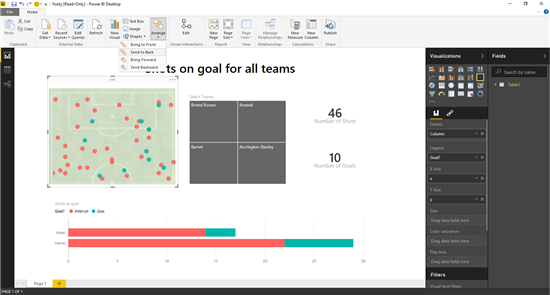 This month’s update includes lots of new features, spread across all areas of the product – ranging from 6 new data connectors to 15 new report authoring capabilities, as well as new data modeling and data preparation features. New Documentation Website, now also including localized content. You can watch the following video or continue reading below for more details about each feature. 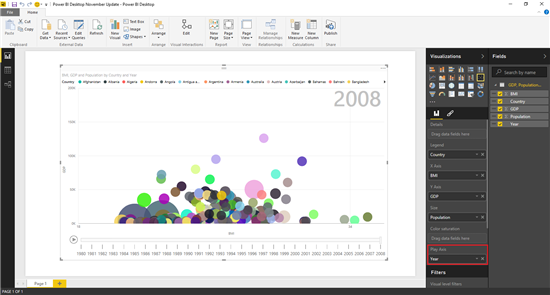 One popular feature of Scatter Charts in Excel Power View is the ability to define a Play Axis based on a series dimension (date, numbers, etc.). 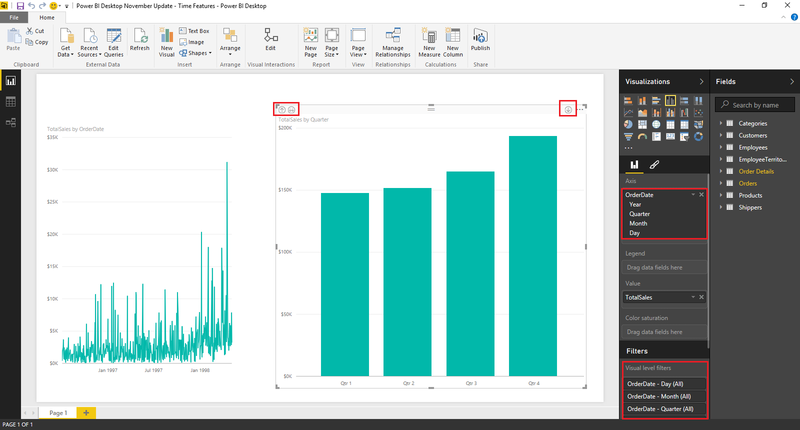 This feature was missing in Power BI Desktop, but it has been added in this release. 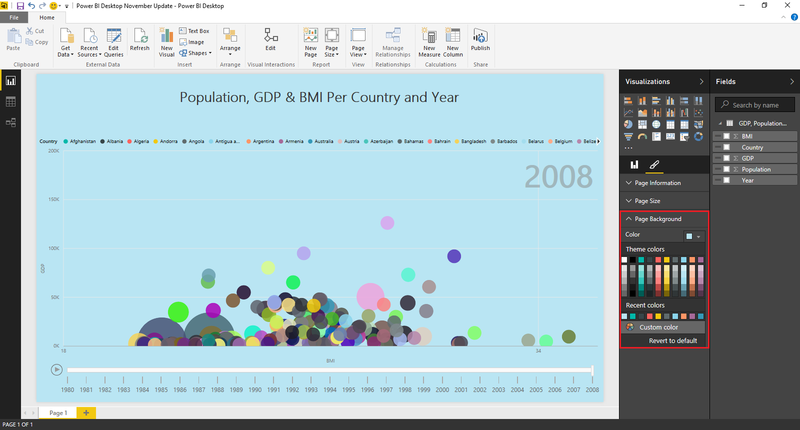 When creating a Scatter Chart, users can now also add a field to the “Play Axis” section. This will create a Play Axis below the Scatter Chart visualization, which users can interact with to play/pause the animation. 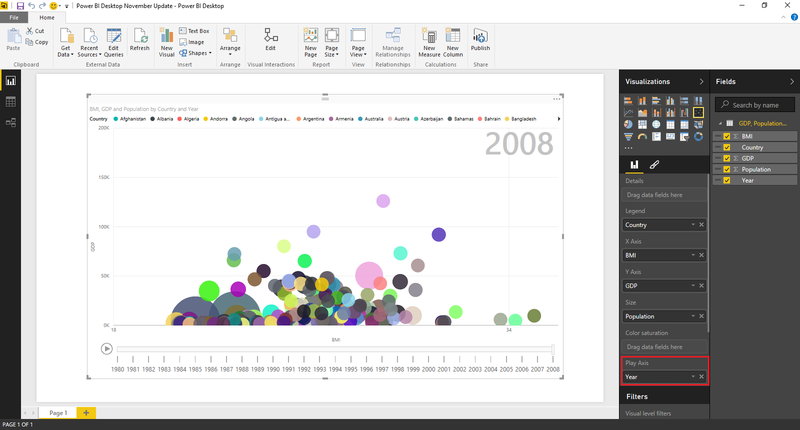 See Play Axis for Scatter Chart in action in the following video. In this update, we have added support for controlling the orientation of Slicer items so users can switch between vertical (previous behavior) and horizontal. This option can be found in the Formatting pane for Slicer visualizations, under the “General” section. See Horizontal Slicers in action in the following video. Another improvement for Slicer visuals this month is the ability to control the selection behaviors: having a “Select All” option or not, and “multi-select vs. single-select” behavior. These options are available in the Formatting pane for Slicer visualizations, under the “Selection Controls” section. See Slicer Selection Behaviors in action in the following video. With this update, we’re making it easier to control the Z-order of items within the Report canvas. Users can now leverage the Arrange options in the Home tab in the ribbon to send items to front/back or forwards/backwards. 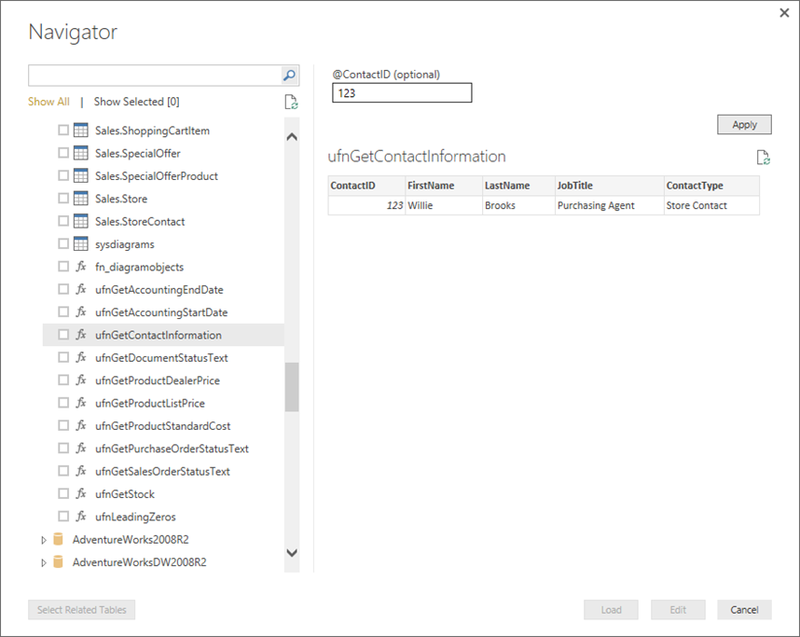 See Z-Order Control in action in the following video. We have added an option to customize the background color of Report pages. 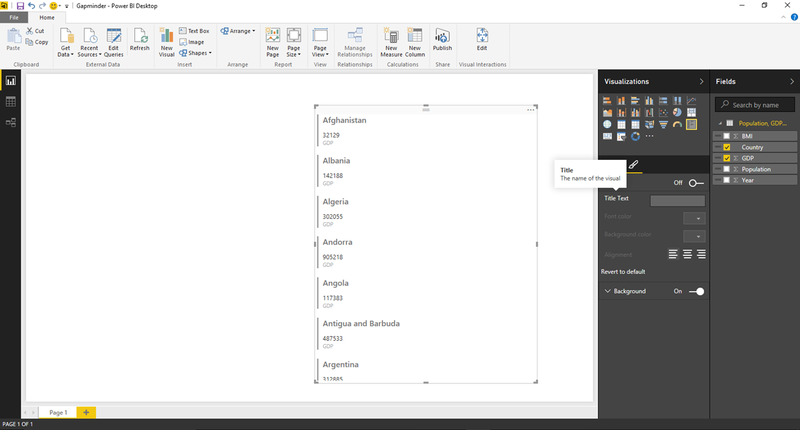 This option is available in the Formatting pane when the page is selected (i.e. no other visual is selected). You can achieve this by clicking on an empty area on the page. See Background Colors for Slides in action in the following video. With Power BI Desktop, users can easily combine multiple visualization elements in a single page. Once there are multiple elements in a page, the default behavior is such that selecting elements in a given visualization will cross-filter or cross-highlight the related data in other visualizations within the same page. 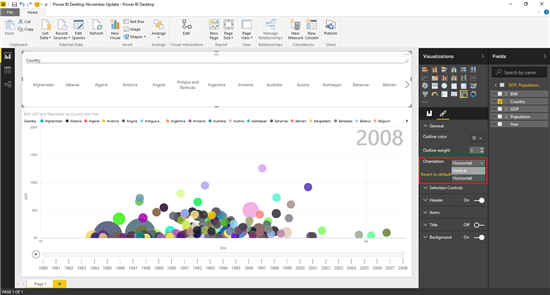 For example, in the following screenshot, selecting “1984” in the top-left column chart will result in the scatter chart and tree map being filtered to only show data for that year. With the November update, we’re introducing a new feature called “Visual Interactions” (also known as “Brushing and Linking”) that allows users to customize this behavior. With this feature, during report authoring, you can edit the visual interactivity option from the ribbon, select each visual that would act as the source of brushing and set the interactivity level in each of the consuming visuals in the same page without any layout restriction. This option is available in the Home tab in the ribbon, under “Visual Interactions -> Edit”. You can see this feature in action in the following video. 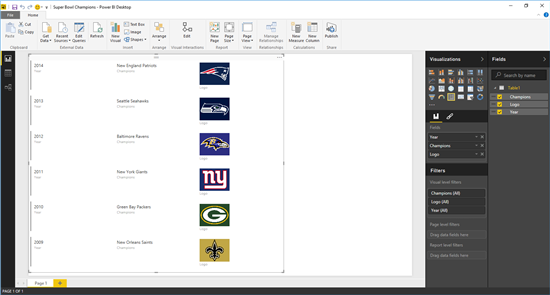 One commonly requested feature by many of you is being able to duplicate pages in your reports. This would save you time when building multiple pages with the same layout, so you can use a page as a template that then you could customize. In this update, we’re adding “Duplicate Page” as an option in the contextual menu for a page tab at the bottom of the report view. 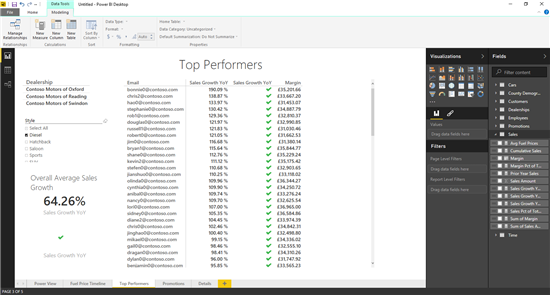 See Duplicate Page in action in the following video. We have enabled support for Images and KPI elements within the following visuals: Tables, Matrix and Card. 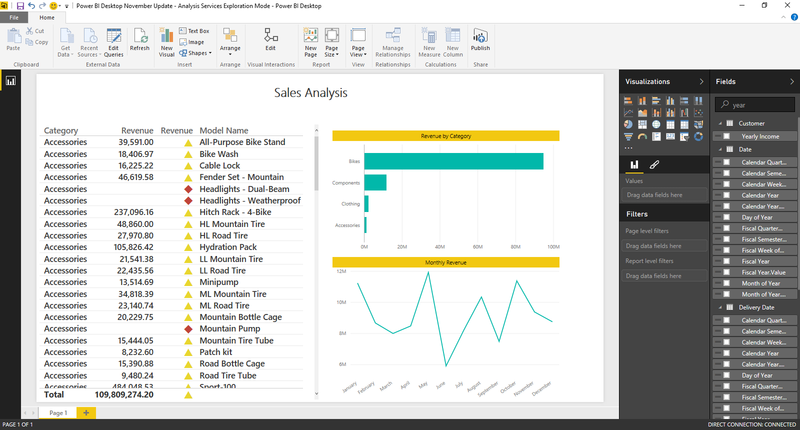 In order to use KPI elements, you can consume them from a data source that supports KPIs, such as Analysis Services or Excel PowerPivot models. Images can be enabled in your reports by categorizing a text column containing URLs to image files as “Image URL”. To do this, select the field in the Fields pane and assign the “Image URL” category in the “Data Tools – Modeling” tab in the ribbon. Once a field has been categorized as an Image URL, users can view the images in Tables. Matrices and Cards. See these features in action in the following video. We have made improvements to the logic to display tooltips in area charts & line charts data points, so that the displayed tooltips don’t overlap with the actual data points. In this update we have added tooltips to better describe the functionality in Field Well and Formatting Panes elements. Visualizations will now display categories with no data. For instance, column charts will display all categories in the X-axis, even those where the Y-axis value is 0 (i.e. due to a filter condition, etc.). It is now possible to customize the display unit in the Axis values. This option can be accessed from the Y-axis section in the Formatting pane. In this update we have made several optimizations so that many basic modeling operations do not require refreshing all your report visuals. Applying these modeling operations (such Show/Hide Fields, All Formatting, Default Summarization, Default Categorization) will result in only the affected visuals being refreshed, rather than all visuals as it was the case in previous releases. This month we’re adding a first set of automatic date capabilities to the product. This first wave of automatic date features consists on automatic detection of Date columns in a visual and enablement of Drill Down/Up behaviors. When dragging a DateTime field to the Field Well, it will get automatically expanded to the entire Date hierarchy (Years, Quarters, Months, Days). The associated charts will also get Drill Down/Up icons that can be used to navigate through the data in different levels of aggregation (by year, by quarter, etc.). We’re adding several new Data Connectors to Power BI Desktop with this month’s update. A total of 6 new data connectors, with many of them being highly demanded in our Feature Suggestions forum over the past few months. 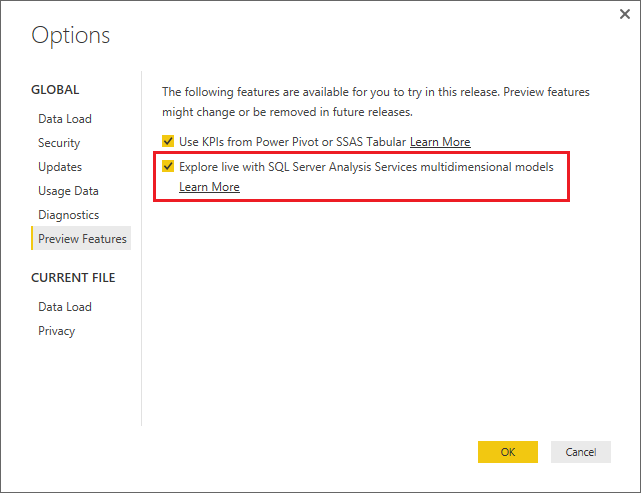 This month we’re enabling a Preview of the Exploration/Live mode for SQL Server Analysis Services multidimensional models. This is one of the most commonly requested features by many of you and we’re glad to announce its availability. In order to try out this feature, you will need to enable it in the list of Preview features. This list can be found under “File -> Options -> Global -> Preview Features”. 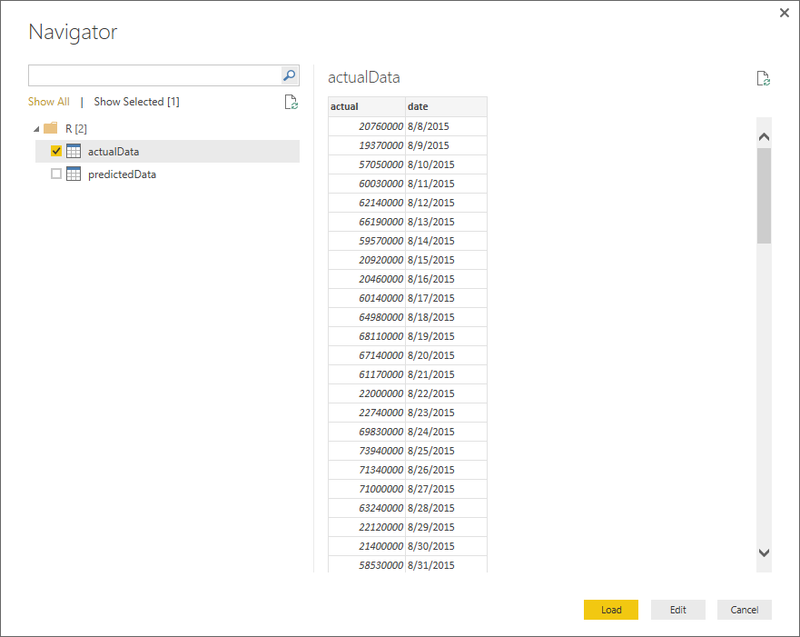 Once this Preview feature has been enabled, users can simply select “SQL Server Analysis Services” in the “Get Data” dialog (under Databases category). 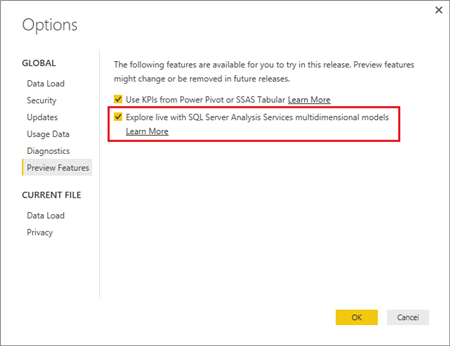 When connecting to SQL Server Analysis Services, users can select Exploration/Live mode. 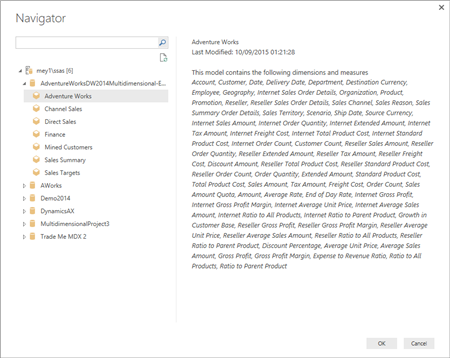 This option has been available since July for Tabular models, but was not supported for Multidimensional models until now. 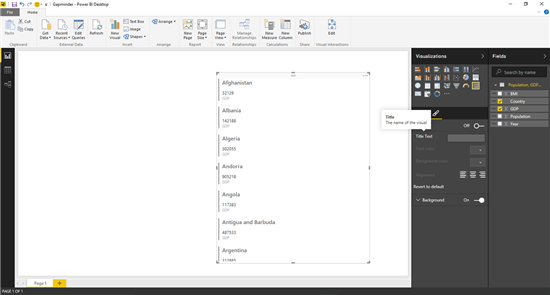 After providing connection details, users get connected to the SQL Server Analysis Services instance and are able to browse to the desired cube. Once they select a cube and click Load, they will be taken into the Report view without having to wait for data to load. At this point, they can drag & drop fields into the Report canvas to author new visualizations. These visualizations will run queries directly against the remote server in order to display the desired information by the user. In order to use this feature, you need to have SQL Server 2012 SP1 CU4 or above version of Analysis Services. You can consume Default Members, Dimension Attributes, Dimension Calculated Members, Dimension Attribute types, Measures (with or without Measure groups), Measures as Variant, KPIs, Image URLs and Dimension security. The feature does not currently have support for hierarchies, display folders, KPI trends, translations and non-aggregatable attributes. 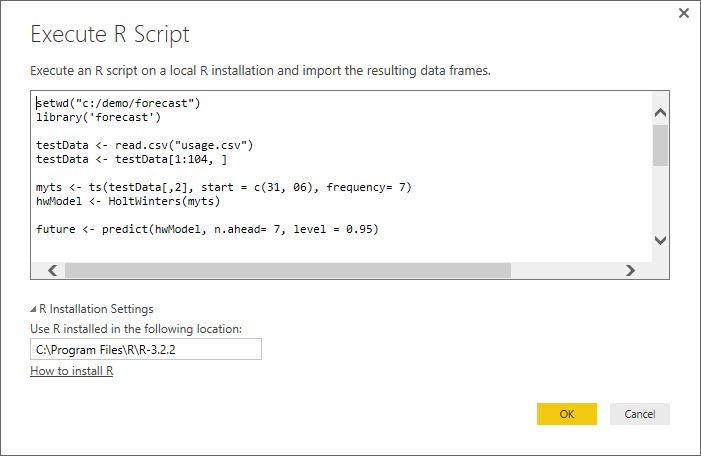 Also with this build you cannot publish the report connecting to MD models to the Power BI service. They will be added in subsequent updates before general availability. SAP HANA is a key Enterprise BI data source and Power BI connectivity is a sought after feature from Enterprise customers to unlock the insights and get 360-degree overview. 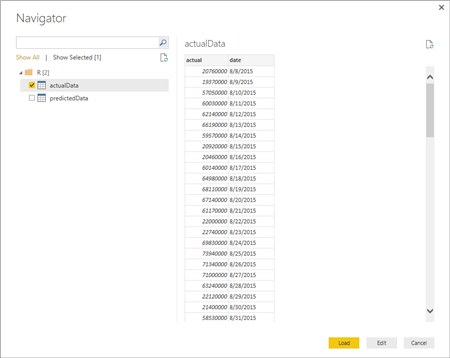 This connector allows users with SAP HANA information models (Analytic Views and Calculation Views) to bring their data into Power BI Desktop. 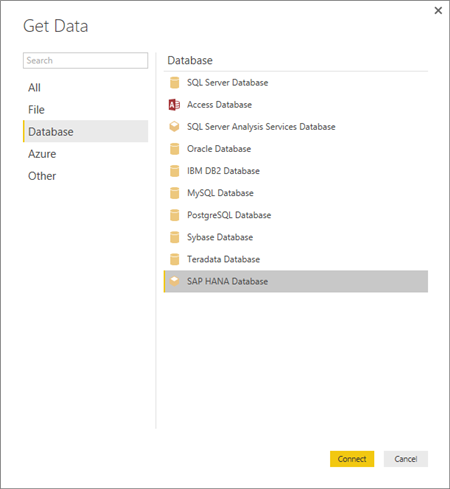 In order to use this feature, users need to install the SAP HANA ODBC driver first on their client machines. The SAP ODBC driver can be downloaded from the SAP support site. If you don’t have access to SAP Marketplace, check with your IT department to get the necessary SAP HANA ODBC driver. 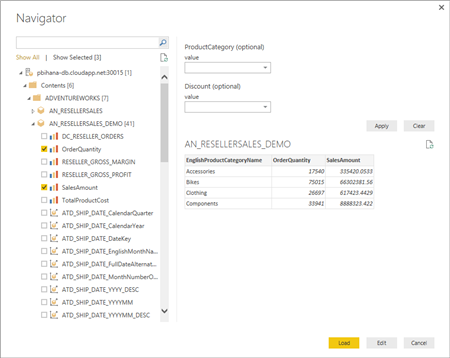 This new connector supports DirectQuery or Import options for connectivity, optimized navigation for HANA information models (Analytic/Calculation views), Direct SQL support for Row and Column Tables and Support for Variables and Input Parameters. This new connector can be found under “Get Data -> Databases”. 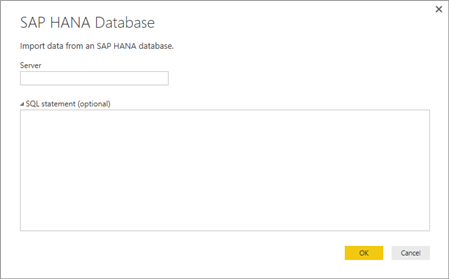 Users can then specify their SAP HANA server and, optionally, provide a SQL Statement to execute. If no SQL Statement is provided, users can instead navigate the list of models and views available to them, and select one or multiple items. They can then preview the data and decide whether to Load it directly to their report or perform any additional Data Preparation steps upfront (“Edit”). See the SAP HANA Connector in action in the following video. We have added another new connector this month, allowing users to bring the data results of their R scripts into Power BI Desktop and take advantage of the other Power BI Desktop capabilities around Data Preparation, Data Modeling and Report Authoring. 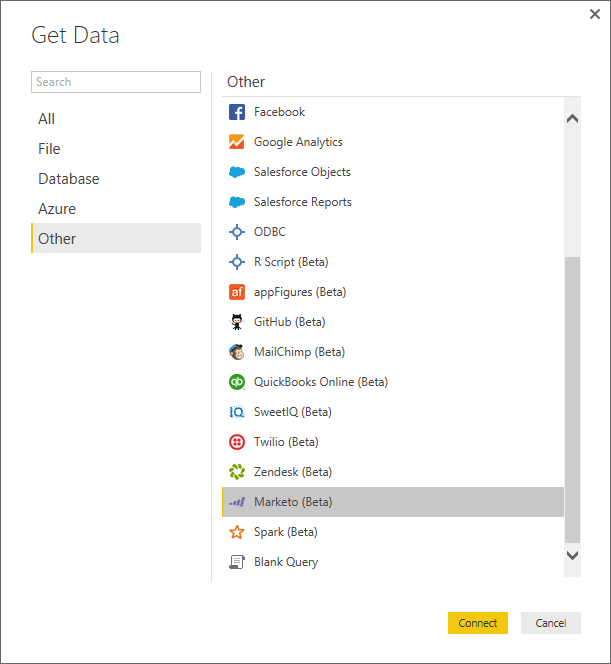 The new R Script connector can be found under the “Other” category in the Get Data dialog. Users can provide an R script to execute on a local R installation and import the resulting data frames into Power BI Desktop. 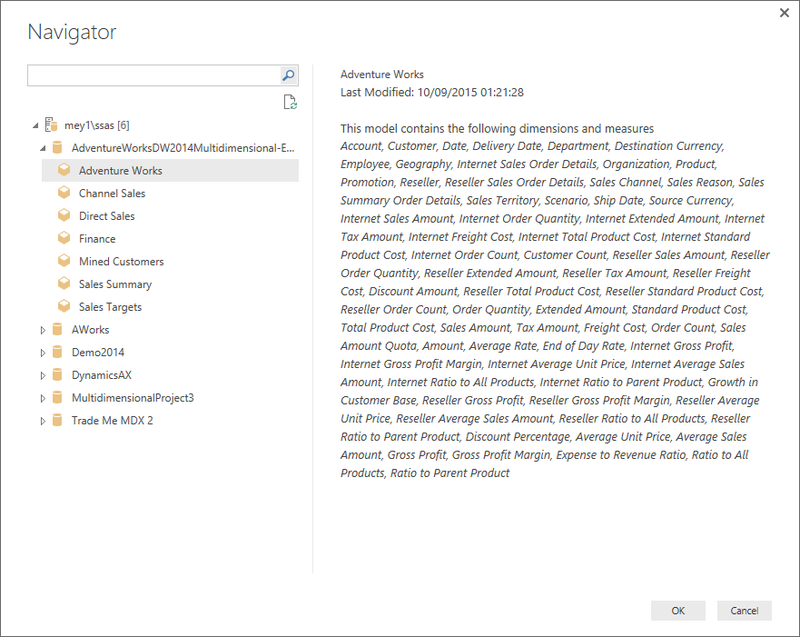 The resulting data frames can be previewed and selected in the Navigator dialog. At that point, users can either load the results directly into their report or apply additional Data Transformations upfront (“Edit” option). You can see this connector in action in the following video. 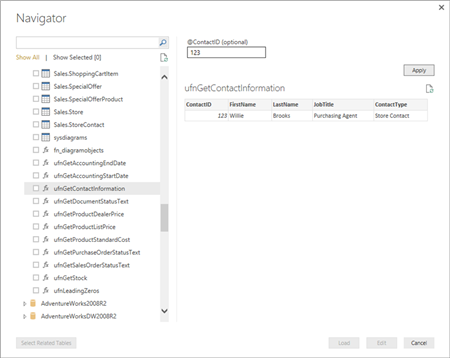 Last month we released a Preview of DirectQuery connectivity for SQL Server and Azure SQL Database. 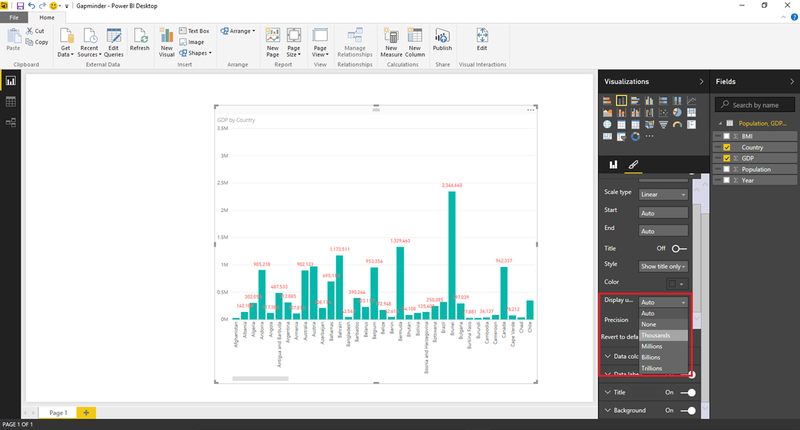 DirectQuery allows users to work against remote data sources and create visualizations without having to import the data to the local data model inside Power BI Desktop. 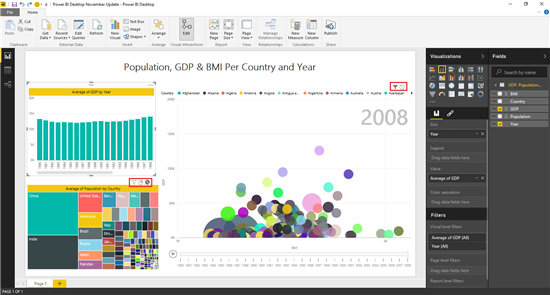 This month we’re moving that Preview feature into a mainstream, generally available, feature in Power BI Desktop. 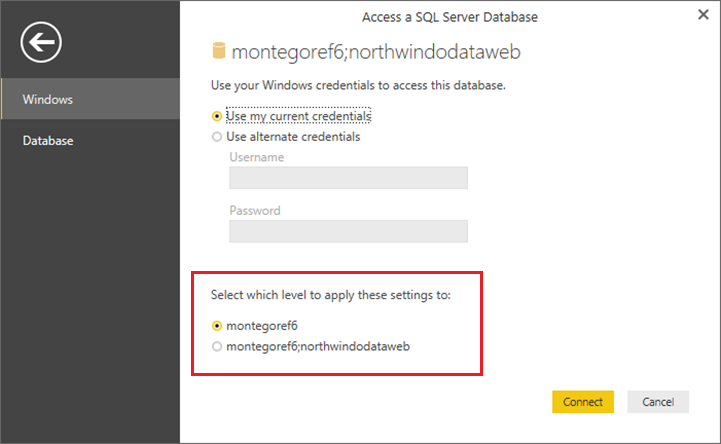 As a result of that, users no longer need to enable this Preview feature and, instead, will be asked which mode to use when connecting to SQL Server and Azure SQL Databases. In addition to making DirectQuery generally available, we’re enabling this option for another data source: Azure SQL Data Warehouse. 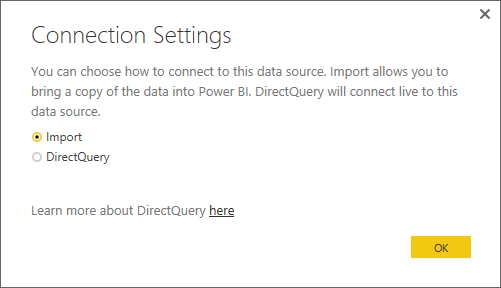 The DirectQuery experience and capabilities for Azure SQL DW match those of SQL Server and Azure SQL Database. Last but not least, we’re also improving the Publish Report experience when using DirectQuery sources. In order for reports built using DirectQuery to work in the Power BI Service, a connection to the data source needs to be established so that the reports can be refreshed at report consumption time. 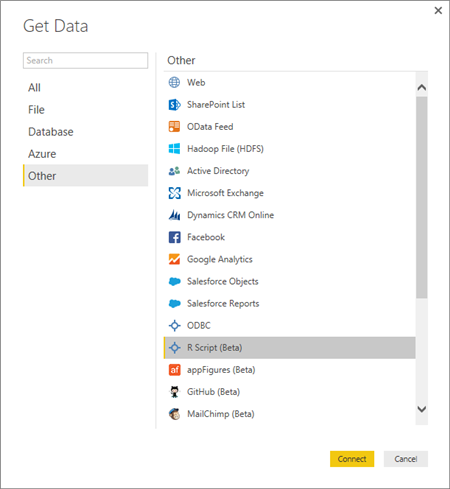 In the case of on-prem data sources (such as SQL Server) this requires using the Power BI Gateway to establish the connection. 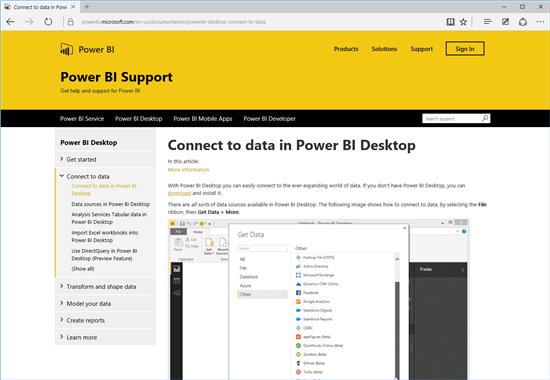 While we still don’t have an updated version of the Power BI Gateway to support this scenario, it is coming in a few weeks. We have enhanced the Publish Report experience for reports leveraging DirectQuery to prompt users to configure their report using an existing (or new) Power BI Gateway. Another new connector this month allows users to import data from an Azure Data Lake Store into Power BI Desktop. This connector can be found under the “Azure” category. 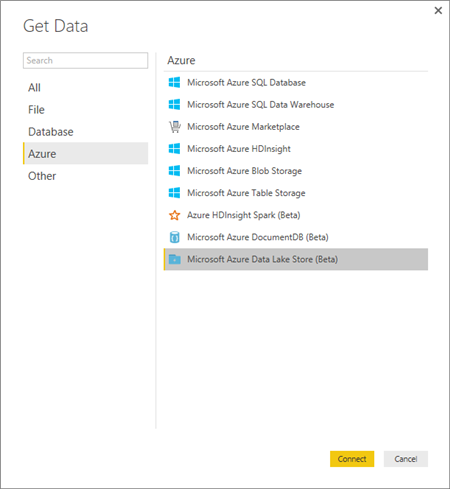 Upon selection of this connector, users can provide the URL of the Azure Data Lake Store account to use. They can then navigate the files available within the account, preview and load or transform them as needed. The last new connector this month allows users to bring in data from their Marketo accounts. This connector can be found under the “Other” category in the Get Data dialog. Users can provide a Marketo REST API endpoint and a Date to being importing data from. Following with our continued incremental improvements to usability in the Data Transformations area, we’re making three improvements this month that greatly simplify common tasks in the product. It is now possible to invoke functions directly from within the Navigator dialog. 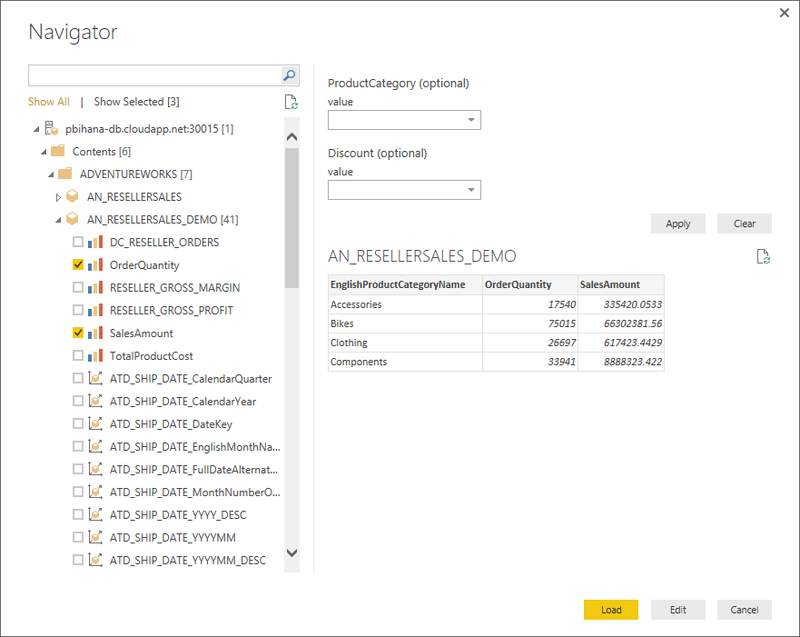 This allows users to invoke and preview results of function invocation against a data source (such as SQL Server or SAP HANA). 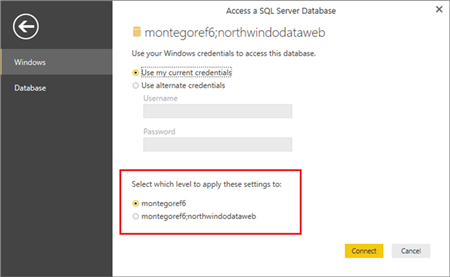 Users are now given the chance to set the scope for their credentials when prompted for Database credentials. This is available as a radio button option at the bottom of the Credentials dialog. It is now possible to add a prefix/suffix to an existing Text column via the UX, either by using this option under Transform (modify column in place) or under “Add Column” to create a new column. Available under “Text Column” -> “Format”. See this feature in action in the following video. The last item to highlight this month is not an actual change in the product, but it’s still something that many of you will find extremely valuable. Our documentation website is a great source of knowledge, but we wanted to make it even easier for you to access the content when you need it. To do this, we have made two major changes to our documentation. The first is a complete redesign of the page, now located at powerbi.microsoft.com/documentation. Top level navigation that lets you view content based on the tool you are using: Power BI Service, Power BI Desktop, Power BI Mobile Apps & Power BI Developer. At the bottom of each article, you can also provide feedback on whether the content is helpful. The second major update is that our documentation is now being localized. We have localized the top 75 most read articles to Chinese-Traditional, French, German, Korean, Japanese, Italian, Portuguese-Brazil, Russian and Spanish, and we will be localizing the remaining articles by Nov 20th. Check out the Documentation Site updates in the following video. That’s all for this month. We hope that you enjoy this new update and continue sending us valuable feedback about our product. Please don’t forget to vote for other features that you would like to see in Power BI Desktop in the future.